Nutella Stuffed Chocolate Raspberry Cupcakes feature a perfect chocolate cupcake stuffed with Nutella and topped with a delightful raspberry buttercream. Taste: I just adore the combination of chocolate and raspberry, especially when a heaping of nutty Nutella is mixed in. Chocolate lover’s dream! Texture: These chocolate cupcakes are perfection – wonderfully tender and moist while sturdy enough to be filled and frosted generously. Ease: Very easy yet impressive! Appearance: Cupcakes are so easy to make beautiful. 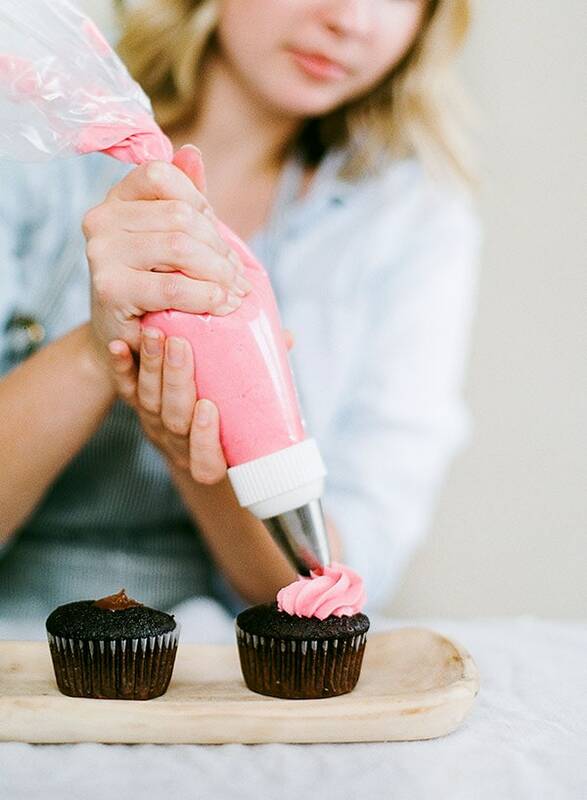 Any of these piping tips from my favorite cupcake set will do the job beautifully. Would I make this again? 100% yes! This cupcake recipe would be absolutely perfect for Valentine’s Day, Mother’s Day, or for any chocolate lover. The combination of raspberry, chocolate, and Nutella is absolutely magnificent. Any chocoholic will be in heaven! But the best part about this recipe? Surprising whoever takes that first bite with the hidden Nutella filling. YUM. If you don’t like Nutella (what’s wrong with you?! just kidding… sorta) then feel free to fill with more raspberry preserves from the frosting. 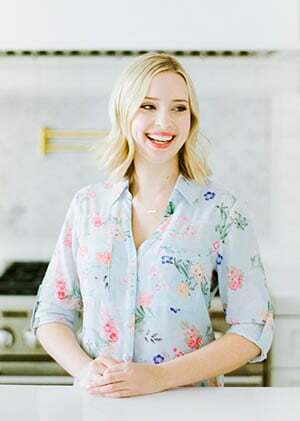 Although this recipe is pretty straight-forward, there’s some tips I’d like to highlight. This chocolate cupcake recipe calls for Dutch Process cocoa powder, which can be found at some grocery stores (like Whole Foods) or most speciality or gourmet food stores (Williams-Sonoma, Sur la Table, etc.) I find the best value is this big tub of the stuff from Amazon! If we’re talking about the science of baking (one of my favorite topics! ), Dutch cocoa powder works differently in a recipe than regular cocoa powder. That’s why you want to be sure to use the right kind, because the recipe may not work properly otherwise. If you’d like to learn more, I have a full detailed post all about the differences between Dutch and regular cocoa powders. Yes, it may seem strange that a cake recipe calls for bread flour. If you’ve ever made chocolate cupcakes or cakes that sank in the middle, then you might be able to guess why this ingredient works well here. Chocolate cakes are often so rich and moist that the structure of the cake can’t hold up. That’s where bread flour comes into play with its higher percentage of protein than AP flour. It helps to develop more gluten to create a firmer structure. Don’t worry, these cupcakes still remain perfectly tender and rich! If you don’t have coffee on hand, feel free to substitute with plain hot water. Or, use a combination of plain hot water + 1 teaspoon instant espresso powder. The coffee simply enhances the chocolate flavor, you don’t actually taste it! Possibly the best part of this recipe, filling with Nutella is made quick and easy with two tools: an apple corer and a ziptop baggie. 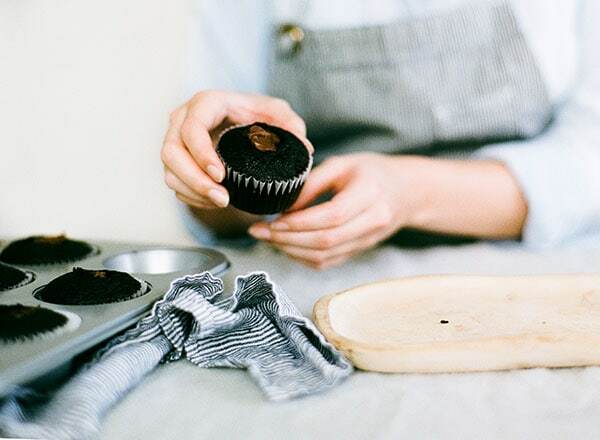 Use the corer to evenly remove the center of each cupcake (this is also a great way to sample the cake to make sure it turned out nicely…). Then spoon the Nutella into the baggie, snip a hole about the diameter of the corer, and squeeze the Nutella into each cavity. The raspberry buttercream in this recipe is really simple. I suggest following the recipe exactly. I’ve found that using seedless raspberry preserves gives the smoothest texture that’s sturdy enough to pipe. You can also really taste the raspberry flavor this way. Fresh raspberries can be too watery, and raspberry jam with seeds adds an undesirable texture (at least in my opinion). The raspberry preserves give a faint pink hue to the frosting. If you want a bolder color, use a very small amount of red gel food coloring. In the bowl of an electric mixer beat the butter until light and fluffy. Add the vanilla. Gradually add the sugar, one cup at a time, beating well on medium speed. Add the raspberry preserves and beat until light and fluffy. For a more saturated color, add a few drops of red food coloring, if desired. Transfer the buttercream to a piping bag fit with a decorative piping tip. Pipe frosting directly onto the stuffed cupcakes. Serve or store at room temperature for a day or in an airtight container in the fridge for up to 3 days. This recipe was originally published 9/17/14 and has since been updated with new photos and more baking tips! Last 2 photos by Constance Higley. I have never watched outlander..or even heard of it! BUT, I would definitely miss these cupcakes too. Nutella and raspberry? My life is compl-EAT! Pinned! I’m having a Cupcakes & Cocktails housewarming and these would be perfect. I’m definitely going to try them out! Can’t wait to try and make these cupcakes! Perhaps I will enjoy them while watching Outlander. Thanks for the great idea!! Oh my these look killer. I’m a sucker for anything with Nutella! Your piping is gorgeous! I would love to see how you did this recipe on video! Frosting level: Awesome! These cupcakes are almost too gorgeous to eat! Oh, what a perfectly frosted, irresistible little treat! I am seriously craving one of these cupcakes now…I wish I wasn’t trapped at work so I could run home and make them! What brand of seedless raspberry preserves did you use in this recipe. I used a brand only local to the Phoenix area. What hot coffee do u use ? If I have coffee powder how could I dilute it to ur recipe ? I made these for a baby shower and they were a HUGE hit! I had some people say it’s the best cupcake they ever had. They were beautiful and the carved out center allowed room for me to put a little plastic “baby” in one for someone to find and win a prize. Just be sure to tell guests in advance if you plan to do this! I wish I could share a pic, but don’t know how. Thanks for this great recipe! Just wondering if the all purpose flour worked as a substitute for the bread flour – I’m worried that the cupcakes will be really dense. They won’t be! These cupcakes are SO moist that the extra protein in the bread flour helps them set up a firm enough shape to be filled. You can trying substituting with all-purpose flour but as I have never done so in this recipe I can’t guarantee it’ll work as well. I made these and they’re excellent.Thanks so much for a great recipe!! I was wondering if you have a version for a cake? I want to make it for my daughters birthday. This cupcake is perfect. I have rather picky culinarians in the family and everyone agreed. Best cupcake ever. Am hosting a small reception after the wedding vows on our deck and wondered if I could freeze the cupcakes a week before and then put the nutella and frosting on the day of the event? So happy to hear that! I believe these should freeze fine, though I’ve never frozen a stuffed cupcake before so I can’t say with certainty. Good luck with the reception! These looks absolutely delishhh – I was wondering if you could convert all the cups into grams if that’s possible? I have a hard time working with cups for some reason..
why oil? can I use butter instead? This is my first attempt at truly homemade cupcakes and I think I have a small problem, I don’t want to share any because they’re so good! I took these to work and everyone loved them, I will be making these many more times & can’t wait to try more of your recipes! I made these last night for my father’s birthday. In full disclosure though, I didn’t have much time, so I cheated by using a Betty Crocker chocolate fudge cake mix. That made 18 cupcakes. I still did the Nutella part, as well as whipped up the raspberry buttercream frosting following your directions. I only had 1-1/2 sticks of unsalted butter, so I used half a stick of salted. I also couldn’t find seedless raspberry preserves with the time I had, so I used Smucker’s sugar free raspberry preserves, and the frosting covered all 18 cupcakes perfectly, though in hindsight I could certainly have put even more on, but they were pretty loaded with frosting! I will definitely be making these again. These are by far the most “gourmet” cupcakes I have ever made, and I still used Betty Crocker, so next time I’ll be making these 100% homemade, because I just feel like I owe it to the recipe to do so! Thank you so much for this great recipe, it is amazing! Everyone loved them. You know, come to think of it, and looking through my browsing history, I have literally no idea how I stumbled upon this recipe! But I’m so glad I did. Could this be made into a cake instead? If so how? Can I use strawberry jam instead raspberry preserve? I made these and they. are. to. die. for. I am planning to make these tomorrow for my daughters 27th birthday an I LOVE Outlander!!! Do you have the buttercream recipe that is very very less sweet and stable on hot weather. Hi Tessa – you mentioned that baking powder should be used with Dutch processed cocoa powder but I noticed your recipe above calls for baking soda? That’s why there’s vinegar in this recipe! My wife will love it, I ‘m going to surprise her on this valentine. Thanks for the delicious Yummy Chocolate cupcakes. These look divine! Can this recipe be doubled or tripled? Also, I followed your Swiss meringue buttercream video and it was delicious! I prefer it over American buttercream. Do you think that should work fine (flavorwise) for this recipe? Have you made these with an egg substitute? I’ve made this recipe as is and it is awesome! Would love to make these cupcakes for my daughters birthday but it needs to be eggless. Cupcake without cream topping plus cup of coffee is a great combo! 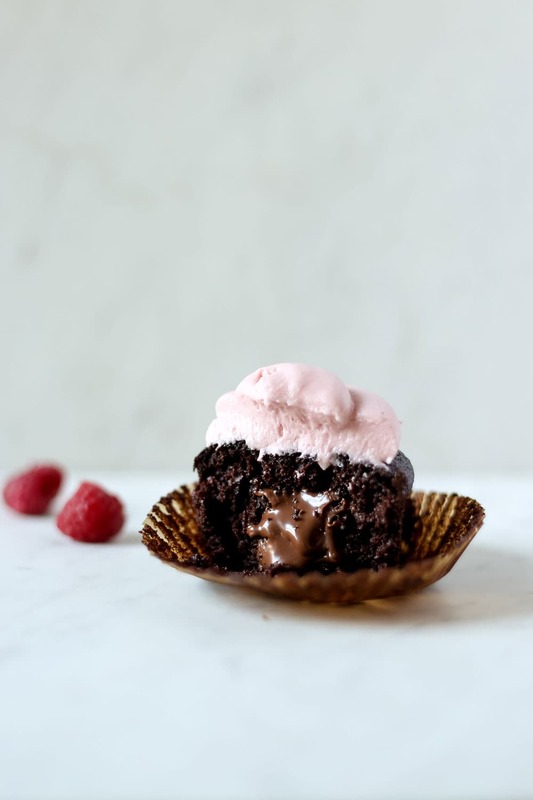 Nutella Stuffed Chocolate Raspberry Cupcakes are high-calorie for me, but will cook them for my husband 🙂 Thanks for sharing! I love these cupcakes..they turned out amazing …in case I want to make 24 cupcakes or 30 cupcakes can I just double the batter ingredients in exactly the same proportion ?